Below is an example of an ECM memo used to approved potential investment banking transactions. 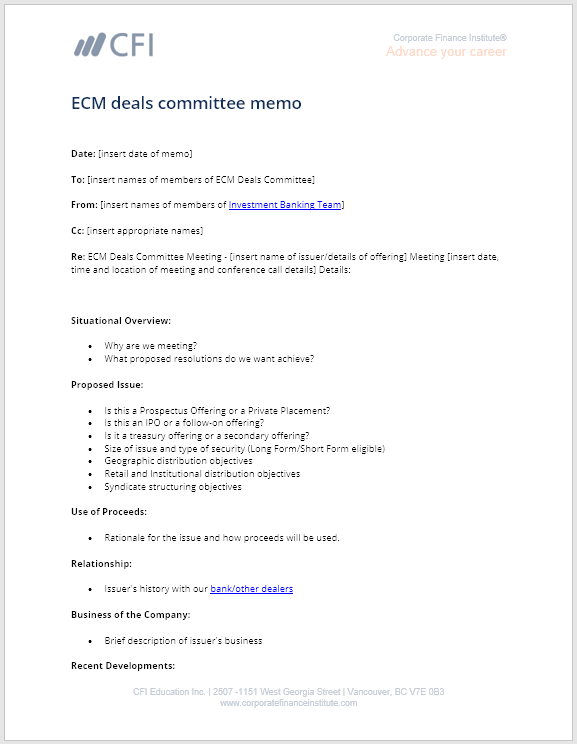 What is an Equity Capital Markets ECM deals committee memo? An Equity Capital Markets (ECM) Memo is generated internally at an investment bank to approve a potential transaction (IPO, follow-on offering, etc.). The ECM Memo is prepared by the investment banking teamInvestment Banking Career PathInvestment banking career guide - plan your IB career path. Learn about investment banking salaries, how to get hired, and what to do after a career in IB. The investment banking division (IBD) helps governments, corporations, and institutions raise capital and complete mergers and acquisitions (M&A). Analysts work 100 and sent to the ECM team. What proposed resolutions do we want achieve? Is this a Prospectus Offering or a Private Placement? Is this an IPO or a follow-on offering? Is it a treasury offering or a secondary offering? Rationale for the issue and how proceeds will be used. Is our bank a lender to the issuer? Is the credit agreement in good standing? Is our bank a shareholder of the issue? What was the price and timing of the last investment? Knowing how to build an ECM Memo is an important investment banking skill-set.